Listening to music is a widely loved pastime, indulged by demographics of all ages, cultures, and backgrounds. What does this mean? It means it’s the end of the sane world as we know it!!! No, just kidding, it means that we’re pretty confident that no matter what your business or event is, your audience will love and appreciate some awesome speakers! Today, I’m introducing three popular speakers which will combat four myths that people attach to speakers when considering whether or not to buy them. 1) They’re not very portable. 2) They’re large and clunky. 4) They must be kept dry. 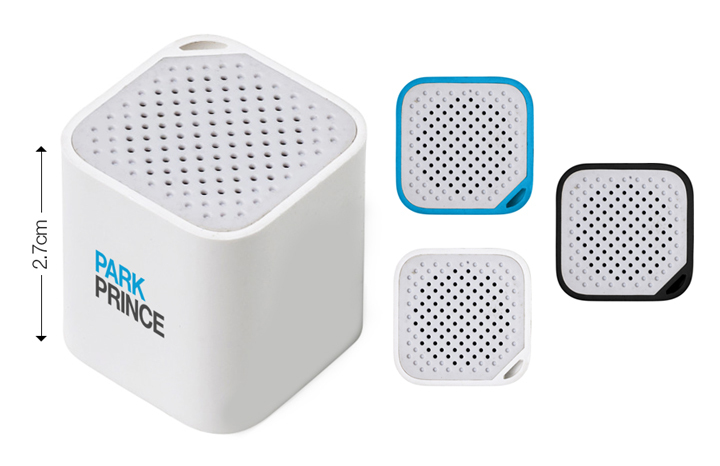 Get ready to have your minds blown by our favourite three, myth-busting, promotional speakers! Dispelling the myths that high-end speakers need to be clunky and eye-wateringly expensive, these fit in the palm of your hands (unless you’re a small child – because you don’t count!) and won’t cost you your entire budget with every unit. Featuring LED light indication, a rechargeable lithium 450mAh battery, AUX/USB cable, and hands-free call function. Durable and stylishly sleek, these make for impactful gifts for showing appreciation to employees and top clients, and winning the attention of target consumers. You can choose between a few well-loved colours: black, grey, orange, blue, red, green. Get them here. Introducing the tiniest speakers in the world! With a firm right hook, these Piccolo Speakers knock out three myths in one go. 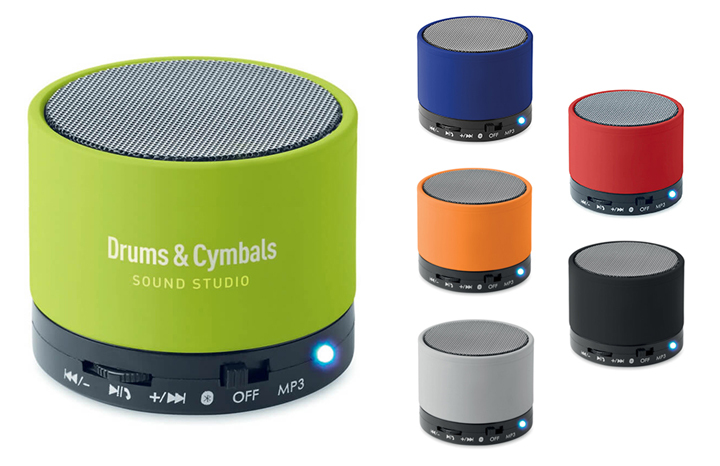 These prove that speakers don’t have to be clunky, can be as portable as a pack of chewing gums, and don’t have to cost you an arm and a leg. Fantastic for outdoor events, college and university packs, technology launches and exhibitions, and many more. What’s more, the miniature sizing doesn’t compromise too much on sound quality either. And finally, these come in white, blue, and black. Get them here. I personally believe that singing in the shower offers an array of health benefits: relieves stress, feeds your inner Whitney, and promotes happiness from the annoyance of everybody nearby. 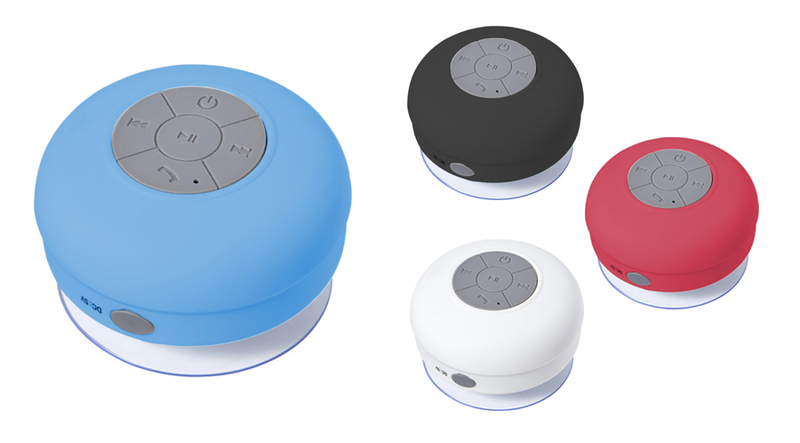 Our next wonder product is the Shower Mate speaker. Enabling high-quality, clear sound from INSIDE the shower; we say goodbye to muffled music from your phone across the bathroom floor! The suction cup allows for easy and sturdy hold on any smooth surface, and comes available in a range of classic colours: white, blue, red, black. Get them here.